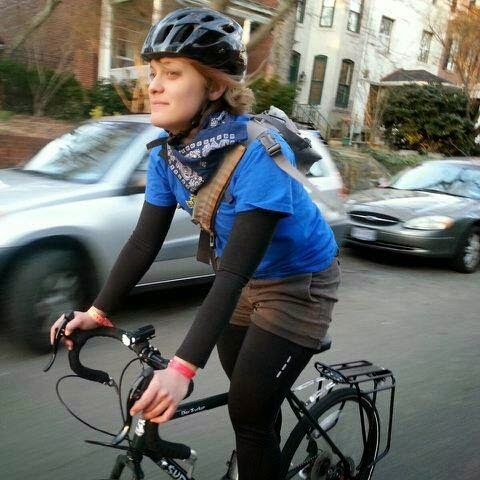 I work at BicycleSPACE (bicyclespacedc.com) and you can find me kvetching about life on Twitter at @rachelcannon. While I work sales, I dream of someday being a mechanic. In my previous full-time position, I installed bicycle racks (while carrying all the tools, including a generator, on a bike trailer), so I love working with my hands. I am also a musician (I play the violin, viola, and piano) and just got my MA in Museum Studies from GW (and am, to be frank, perfectly content to have a job that includes bicycles). 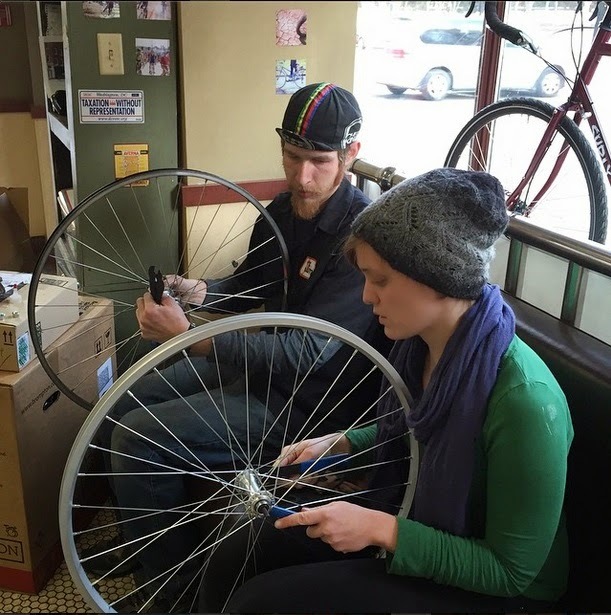 You work at BicycleSPACE- tell us about the shop and what you do! The shop has been in DC for about 4 years. They’re generally geared towards city commuters—lots of steel bikes that can double as touring bikes or recreational weekend-type bikes. But we’re pretty laid-back and pride ourselves on not being “that” bike shop. A lot of customers come to us because they’ve had problems with attitudes at other shops…plus we offer a few classes, rides, scavenger hunts…it’s a fun shop, and the owners are bike advocacy-oriented. That’s why I wanted to work here to begin with. I'm not sure what it is, but men are way more into buying cool stuff. Again, this is very generalized, but while my co-workers are drooling over a carbon bike with electronic shifting (that, I would like to add doesn't come in short woman-friendly sizes), I'm kind of thinking "Jesus, how can anyone afford that??" When I talk to women about bicycling, it's more about where we ride and the experience of being on the bike--not necessarily the bike itself. I realize that a better bike can improve that experience, but some people just don't want or need to spend $5,000 to be happy. The guiding job changed my life because I was riding something like 30 miles a day and meeting so many people, male and female, who had incorporated bicycling into their everyday lives. The issue was never gendered for me, honestly, until I started installing bike racks for a bike advocacy group in 2012. They did a lot of great work involving women in the bike industry, and I began to see cycling as a place where I could maybe help break down some barriers. There's definitely a perception of working in a bike shop as being a slacker-ish job. And I think women especially are under a lot of pressure to do well in school and get a good job. But the industry needs smart, capable, creative people. And women are all three of those things. Obviously, men are too, but we've already got them! The industry could only benefit from more points of view. I think if more bike shops professionalized and made a habit of hiring for full-time, challenging, well-paying positions, you'd see more women coming in. 2. I’m not a brand snob, and I will never be one. I think cycling should be accessible to everyone, so people should find bikes within their budgets. While our bikes start at a very reasonable $450, I know that’s a huge financial commitment for people. Is that gender-related? Probably not, but it’s definitely empathy-related. This is a generic answer, but any industry can only benefit from introducing different points of view when only one dominates. In terms of employment, I’d say keep the (hetero) male-oriented conversation in check. I have absolutely no problem telling my co-workers to shut up when I feel like they’ve stepped out of line or said something offensive, but this might be an intimidating situation for other females. Also, it's another stereotype, but I think that women don't like slovenly work places. As customers, don’t assume that you know what I want. Please don’t try to foist your own opinions off on me. Let me talk, and actually listen to what I’m saying. As sales associates, we’re taught to do this with customers in general, but I think it’s especially important to do this for women, who will often be less assertive of their opinions in deference to another person. I would like to think so. Not always, but often, male/female couples that come bike shopping for the woman are doing so because the guy thinks the woman should ride more. Or perhaps she’s expressed an interest herself, and he’s gotten all excited to take her to a bike shop. It’s pretty clear when women are uncomfortable being there, and I try to make them more comfortable. Most of the time, he will start off the conversation by saying, “So what size bike do you think she should ride?” when there are so many more important questions to be asking! I’ll often deflect with a, “Hm, it’s tough to say,” then ask the woman why she wants to ride, what kind of bike she wants to ride, and just generally focusing the conversation on her. There was one guy who came in with his wife/girlfriend and actually said , He said, "Pink....you know, or anything pastel." She gave him kind of a quizzical look and said, "I like neon." And I know a lot of people hate this word, but good LORD do I hear a lot of mansplaining between hetero couples that come in. Oftentimes the guys in these situations have no idea what he's talking about, so I will politely interject and correct. Some (if not most) males are perfectly fine, but this has happened enough times to suggest that it's a widespread issue. It’s also nice because women have lots of fitting issues where bikes are concerned, so as a short woman who struggles with fit, I can provide some helpful pointers. I got to enter my first cyclocross race! It was at the end of the season, so sadly it was just the one, but I hope to pick that up as a hobby. :) I've also learned a few mechanical skills (although I keep bugging the service staff to let me learn more, it's tough to juggle sales with trying to train up as a mechanic.) Obviously I've learned a ton about different bikes/brands/styles/components, and the shop is sending me to train on how to fit people on bikes. TERRY SADDLES AND SHORTS ARE THE BOMB. Seriously. I recommend them to every lady. For clothing, I like casual, comfortable, riding gear. Not necessarily bike-specific (while that can be nice, I disagree with the premise that you need to have money to ride, and, well, bike clothes are expensive). Perhaps because women tend to be more risk-averse, they're more hesitant to get involved with an activity that involves pedaling a little machine around roaring two-ton vehicles? I also think it's very easy to get overwhelmed by the potential financial investment and the competitive cycling culture...although that's not unique to women, I think they're more likely to shy away for those reasons. I have also heard that women are less likely to bike commute to work because it involves getting sweaty and messing up their clothes/hair, especially for jobs where they are expected to look super professional. While I find this argument slightly insulting, I could understand how it might be a deterrent. But honestly, changing clothes is a super easy thing to do. Do what feels right for you! While bike shops can definitely provide good advice (we try very hard to get customers on the best bike for them), don't listen to any sales person who isn't listening to you. Don't worry about what other people think, either. Bite the bullet, get yourself a bike, and go from there. That's the first step! I love it! It's just plain fun, and it's pretty easy (especially if you live in a city) to work it into your everyday life. Bicycling can also provide a really positive change in terms of rampant societal body image issues. When I was a teenager, I had a really unhealthy relationship with food and my own image, and both improved drastically once I started riding. Rather than being ashamed of my naturally gigantic legs, I'm now really proud of them--they're my engine, after all. And calories are a good thing--they give me the energy to do what I do. I can bend my thumbs all the way back to my wrists. My sister is the only other person I have ever met who can do this. Rachel Cannon is an extremely cool lady. I honestly don't know what the future holds for her, because I can see her doing just about anything.